drills and training exercises to help make classes new and fresh and his students the best they can be. Having competed extensively in both youth and adult divisions, Dane's coaching is top notch for competitors. He also has an interest in real world self defense, and makes both part of his long term goal for his students. As with our other locatoins, we cycle our other instructors through at varying times. Karen or Jim Saxton teach Tai Chi at this location twice a week. Email your name, address, phone number, and prospective students' name(s) and we will schedule your intro for you. Nothing to lose by trying a class today! 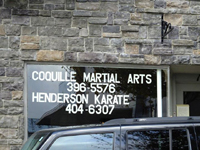 We are the oldest traditional martial arts school in Coos County, having started in Coquille, in May 2000. Thus we are beginning our 15th year continuous year serving Coos County, following a tradition started by our first instructors in Coquille. Unlike other schools who claim their instructor's time as their own in order to pose as the longest running or most experienced school, we stand on our own merits. We offer TKD instruction Mondays, Wednesdays and Thursdays and beginning Tai Chi Monday and Wednesday. While Tae Kwon do students are encouraged to come to the main dojang on Fridays for systema or to make up missed classes on Tuesdays. 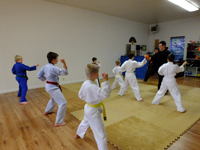 a full TKD curriculum can be had from the Coos Bay location. Dane Saxton teaches Tae Kwon Do at our Coos Bay facility along with Karen, who teaches the Tai Chi class on Wednesdays. Dane has an impressive resume, including Grand Champion black belt sparring at a number of tournaments. Kids are inspired to work hard by his example. You may start these classes at anytime. 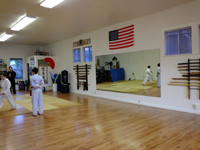 If you call the main dojo ahead of time, we will do our best to have everything ready for your first class. Coquille office hours are all day Tuesday and Friday, and most mornings and afternoons except Wednesday when we are at the Bandon and Coos Bay locations. Feel free to fill out a request for information form (below) and we will contact you, either by phone or email. With 1 year at the GreenSpot, 2 years in Old City hall and 10 years at our Bandon location and 14 in Coquille, we have a track record that is proven. We teach your child self respect and respect for others in a safe, nurturing but tightly disciplined fashion. 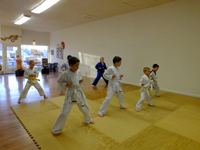 The martial arts have the lowest incidents of injury among children when properly taught. Our adult students include Coos County deputies and jail personnel who have found our training to be effective. We teach a full martial arts curriculum using TKD as our base art, and hapkido for self defense. Our instructors are backed by the Kukkiwon(World TaeKwondo headquarters) in S Korea and the United Hapkido Federation and American TaeKwondo Jidokwan Association headed by Grandmaster Suggs. As with any professional, professional deveopment hours and training is important. Our head instructors average 8 hours a month training to keep their material fresh and up to date, working with notable instructors in Tae Kwon Do, Hapikdo, Systema and blade work. Feel free to ask what seminars we have taken this year! To find us at our new Market St Location, come to Market St, near the corner of Hwy 101, across from the Tioga on Market. 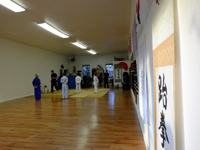 We are now sharing space with Henderson's Shorin Ryu, the second oldest traditional dojo in the county. Schedule your free intro to any class now!